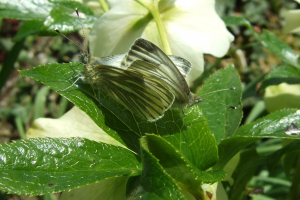 Observation - GREENVEINED WHITE BUTTERFLIES MATING ON HELLEBORES - UK and Ireland. Description: White butterflies withwing veins pickedout indark lines. White butterflies withwing veins pickedout indark lines.